The trio from Albany (NY) was founded by singer / guitarist Lee Curley and bassist Bob Horvath  after they met Gregory Nash which is their skinsman now. In the past the twosome played with Shadows Fall drummer Jason Bittner in Eyesore. 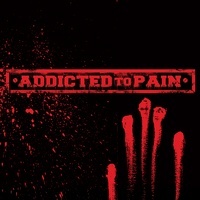 And quite a few other bands afterwards, but now they focus on Addicted To Pain. This 4-track EP is available through the bands website or iTunes. The opening track is Hear N Now, a track based on a heavy groove with thrashy elements and power metal citations. Trust Me sounds even heavier, they add faster passages, but it's the spoken words which give the song it's intensity. The chorus reminds me a bit of Anthrax... Overkill... But they combine the old thrash sound with some modern groove. Unfortunately I only know two songs of the EP, but I can't wait to hear more from Addicted To Pain. And live these songs will be killer! Check out these tunes at their MySpace!